Jack Green tackles an Upton player. ALCESTER secured a second successive comfortable win as they put hosts Upton to the sword on Saturday. 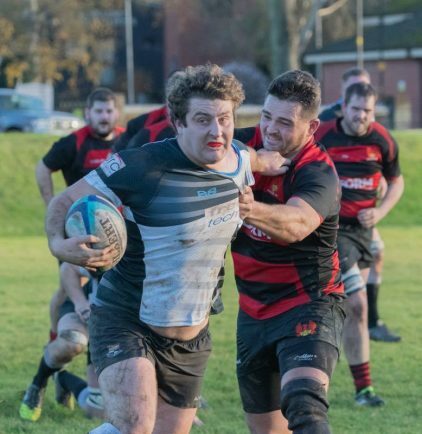 Jack Green led the way with a hat-trick of tries and captain Phil Birks bagged a brace to inspire the Kings Coughton men. Alcester were missing a few key first team players which brought a reshuffle to the squad including Green making an appearance at flanker, whilst several of the development team made the starting line-up. The team gelled well and played with fluency and determination. Alcester were immediately on the front foot with a set of good hands which sent Louis Smith on the charge before offloading to veteran Robbie Parker who crossed the line minutes before he had to leave the pitch with an ankle injury. Birks crashed over the whitewash next from short-range after a ruck close to the line. Max Biltcliffe added the extra points. After a series of straight drives which stunned the Alcester defence, the home side were able to get on the scoreboard. However, Alcester scored three more times before half-time courtesy of Kyran Flynn and two from Green, with Biltcliffe converting twice to give the Red & Blacks a 33-5 lead at the break. Upton reappeared a bigger pack, upping the aggression and taking Alcester on up front, but the visitors still had the better of the lineout with Birks and James Hibbard dominating. Upton controlled the scrum and from one inside Alcester’s 22m line they picked up at the base and drove over for their second try. Green returned to the more familiar position of centre where he secured his hat-trick after going on a powerful run and shrugging off several tackles to score out wide. Birks then scored the seventh and final try of the game for Alcester. Alcester coach Chris Johnston singled out Mat Ashby as being a rock in defence and skipper Birks named Chris Howell man of the match. Eighth-placed Alcester host local rivals Woodrush on Saturday, when the visitors will arrive one place and one point better off than their hosts.